We overheard that the Presidential son has made his statement. The Presidential Son Paolo is also current Vice Mayor of Davao City. 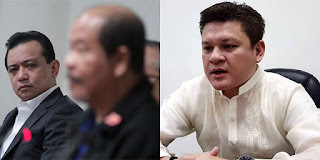 Vice Mayor said that "No less than retired SPO3 Lascanas admitted that he sought the help of Trillianes in recanting from his earlier Senate testimony." "This only shows that Trillianes is behind the latest Lascanas testimony that not only dragged the name of President Duterte in the summary killings but also tried in vain to include me and my friend in the illegal drug trade. "